SCOTTSDALE, ARIZ. – Dec. 07, 2016 – Barrett-Jackson, The World’s Greatest Collector Car Auctions®, will feature an incredible docket of collectible Chevrolets during the 46th Annual Barrett-Jackson Scottsdale Auction, to be held Jan. 14-22, 2017, at WestWorld of Scottsdale in Arizona. The predominantly No Reserve auction’s exciting lineup of Chevrolets will include a 1969 L88 Corvette (Lot #1369) that is one of 216 produced, as well as a rare 1969 Chevrolet COPO Camaro (Lot #1294). The 1969 L88 Corvette (Lot #1369) is one of 216 total L88s ever built. This Corvette is equipped with a 427/430 horsepower L88 engine with factory side pipes, and the original red line tires that came on the car. With only 16,482 original miles, this car had a rotisserie restoration, has earned numerous awards and was featured in the February 2015 issue of Vette magazine. Another anticipated consignment is the 1960 Chevrolet Engineering Research Vehicle (CERV) 1 (Lot #1390), which was developed between 1959 and 1960 by Zora Arkus-Duntov. Considered one of the most significant pieces of American automotive culture, CERV 1 was developed as a functional mid-engine, open-wheel, single-seat prototype racing car. While this race vehicle was only used for test laps during the 1960 U.S. Grand Prix, its main purpose was to develop Corvette suspension and driveline components for the production car. It stands as one of the experimental landmarks of GM history. The Scottsdale docket will feature a rare Daytona Yellow 1969 COPO Camaro (Lot #1294). It’s powered by a date-code-correct L72 427 engine churning out 425 horsepower that is connected to a Muncie 4-speed manual transmission and rare CVE-code posi-traction rear end. The stunning car underwent a full restoration in 2010 using a combination of refurbished original, reproduction and NOS parts. Other notable Chevrolets crossing the block in Scottsdale include a 1970 Nova Yenko Deuce (Lot #1300), which is one of 175 produced. Finished in a rare Citrus Green, it comes factory-equipped with the COPO 9737 sports car conversion package and is powered by 360 horsepower LT1 engine. 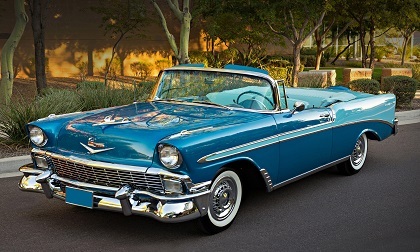 The Scottsdale docket will also include a 1956 Bel Air convertible (Lot #1056) that features a 205 horsepower Power Pack engine. Two of the rarest small-block Corvettes ever built in sequential years will be auctioned. The 1962 327/360 Heavy-Duty Brake “Fuelie” (Lot #1327) and 1963 Split-Window 327/360 “Fuelie” (Lot #1393) are both fuel-injected with heavy-duty brakes and suspension. Both are also silver over black.